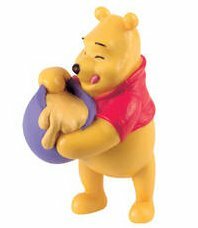 Winnie the Pooh figures are highly detailed pvc figures made by Bullyland. Winnie the Pooh, also called Pooh Bear, is a fictional bear created by A. A. Milne. The first collection of stories was the book Winnie the Pooh in 1926, which was followed by The House at Pooh Corner in 1928. Winnie the Pooh figures make great Cake Toppers for that special birthday cake. Winnie the Pooh = Honey! Why? He�s very sad if there is no honey in the house because honey is his favorite food. Unfortunately, he is not very intelligent, but when it comes to getting honey, Winnie the Pooh is very inventive. Usually, he outwits the bees in order to get their storage of honey. Piglet is a timid little pig. He is afraid of all sorts of things and he panics easily. Piglet is often blown away by the wind, because he is small and doesn�t weigh very much. Winnie the Pooh is his best friend. In the evening, he sits with him on the grass for hours and watches the sunset. 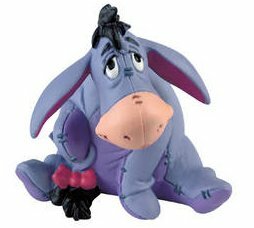 Eeyore is a Donkey. He is usually very sad. He lives alone in a hut, which isn�t good because he breaks down frequently. This is not his only problem; he has a pinned tail that keeps falling off.